NGC 7814, or "the mini sombrero" is a spiral galaxy located approximately 40 million light years away seen edge-on from earth. Hidden between the foreground stars - stars that are part of our own milky way galaxy - many distant background galaxies can be spotted; pretty much everything that is not quite round and sharp is in fact not a star but an entire galaxy maybe hundreds of light years away, and each made up of many millions of their own stars (an planets). 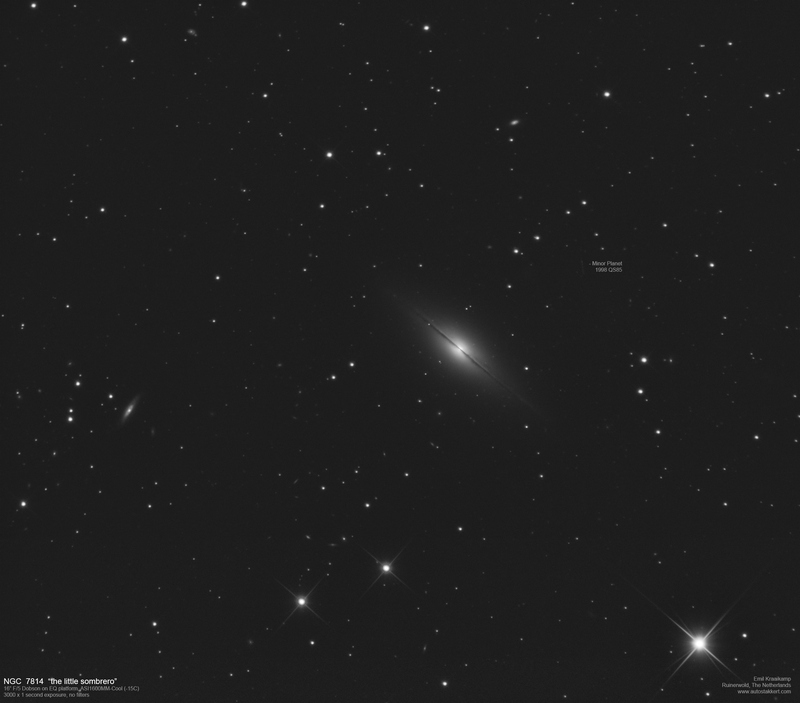 Close to the mini sombrero galaxy, a very faint line can be seen. This is actually more of a point-like object that was moving during all exposures, essentially drawing a line in the image. It's an asteroid, part of the main asteroid belt between Mars and Jupiter. The minor planet has the designation (79568) 1998 QS85, and it was almost in opposition, meaning that seen from earth, the asteroid is opposite from the Sun. It's not many millions of light years away, instead the photons the camera caught, left the asteroid only 10 minutes earlier. The image was made with a 16" Dobson F/5 telescope on an EQ platform, with an ASI1600MM-Cool camera. In total about 4000 exposures of 1 second each were created, of which the best 3000 were combined and post-processed to create this image.